Founded in 2000, and located in central London, Law Firm Limited provides a full range of immigration assistance and services, thus offering a complete relocation package for both individuals and businesses. With a range of professional staff able to provide assistance in English, Chinese, Farsi and Russian (together with other languages), we are able to provide timely and accurate guidance to all clients, irrespective of nationality. We are experienced not only in all types of visa, immigration and nationality matters, but we are also able to assist with the complete process of establishing a business or commercial presence in the UK. We provide guidance and advice in relation to all relevant property, tax, legal, company formation and banking procedures. We also have the capability to undertake credit searches and carry out enquiries relating to prospective commercial partners in the UK, in order to reduce the risk of entering into unsuitable alliances or partnerships. We aim to provide cost-effective approache to the needs of individuals and their families, as well as to businesses and commercial concerns by providing the platform for successful economic activity in the UK for migrants and their associated employers or business ventures. Law Firm Ltd can also provide a professional search and selection of property in the UK for clients. Concierge services in relation to property maintenance, renovation or tenancy are also available. With the relevant UK legislation in an ever-changing state of flux, we aim to keep up-to-date with amendments in law and procedure in order to ensure that the advice we give is reliable and compliant with new changes. To this end, our staff undertake regular study and attend training courses to keep abreast of any new developments in law and procedures. 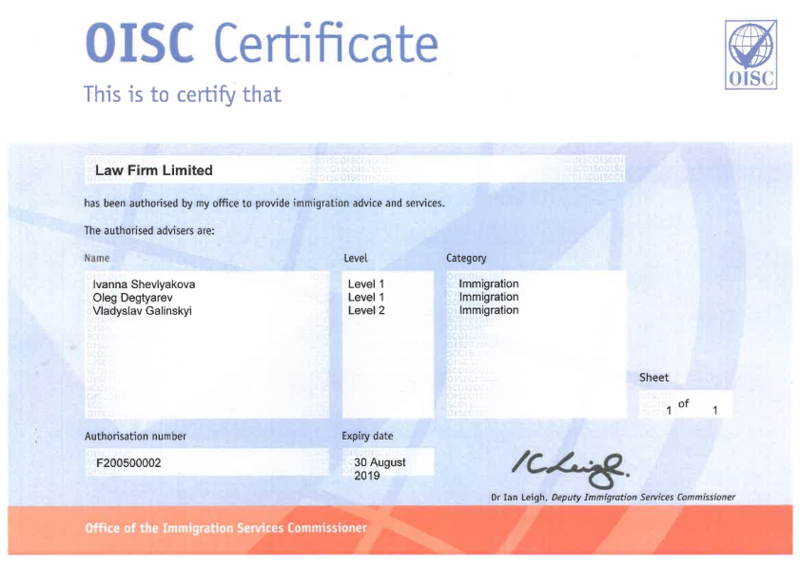 We are registered with the Office of the Immigration Services Commissioner OISC (click to download the certificate), and provide material assistance in all categories of immigration work, encompassing managed migration, asylum, deportation, Human Rights claims, business immigration and EEA applications, nationality and citizenship, appeals at Immigration & Asylum Chambers and other immigration matters of complex nature. Our sister company LF Legal Ltd is regulated by the Solicitors Regulation Authority and can provide legal advice on a wide range of complex legal matters such as litigation, employment and commercial law. They also provide immigration advice on Judicial Review matters, immigration bail applications, deportation, complex Human Rights applications and representation at the First/Upper Tier Tribunal. We have a representative office in Moscow city centre, which can assist on relevant documentation and commercial enquiries.